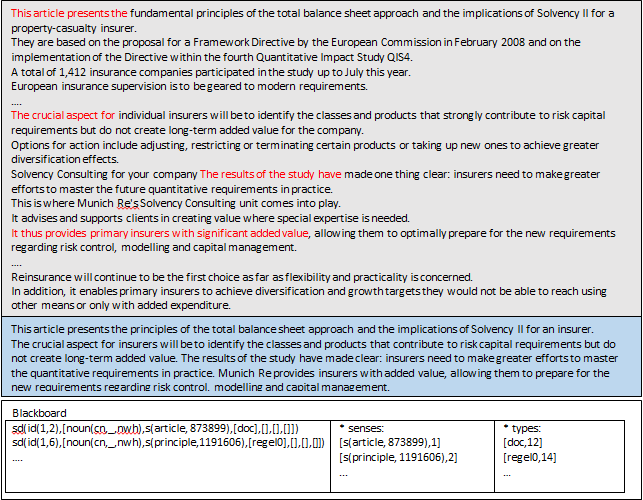 The Text Summarizer extracts the most relevant information of a text and presents it as a short summary. A number of parameters define how this is carried out. The main distinctions of the tool strategies are explained below. Following the text the most relevant sentences (and, as an option, shortenings respectively) are extracted. Sentences are structured into subparts and the most relevant subparts are combined and represented. The text is analyzed semantically and the most relevant information in terms of events and states related to discourse referents is extracted and a summary is generated from the corresponding semantic representation. Below is an example of type a, extended by an excerpt of the semantic evaluation of the text with information about the discourse referents. Please contact us for further information, prices and individual advice by sending us an e-mail.